Some of you may remember the XP to MAC desktop how too, I did a while back, At the time the best skin you could get for winamp was the Ipod skin. That was until now, Winamp has been buggin me to upgrade for age's now but I always so no, I like to know what these auto updates do before I let them alter my PC. 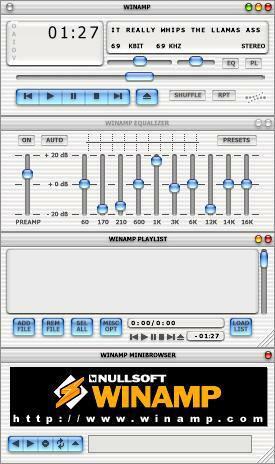 any way while rooting round the winamp site I found a skin to make winamp look like OSX. It complete the OSX look far better than the ipod make do skin.